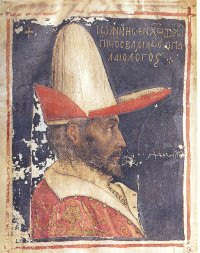 John VIII Palaiologos was a man in frequent crippling pain. He was an oldest son who constantly tried to do the right thing which was never adequate, and who lived a life of unremitting stress for which there were no solutions. His first two marriages were no marriages at all, and his third marriage ended by breaking his heart. He is about forty-six in the portrait to the left. He was twenty-one at the first marriage in 1414 which was political--someone in his position would have expected nothing else--and the bride was a child, Anna of Russia. Constantinople sent a glorious vestment to the Metropolitan of Moscow with pearl portraits of the couple to celebrate the event. The marriage is not likely to have much affected his life. Anna lived in the women's apartments of the palace, and John served as regent while his father, Manuel, was out of the country. In 1416, when Manuel came home, John left for the Morea, and not until he arrived home in 1418 did he learn that Anna had died of the Eighth Death the previous August. His second marriage was one of a.brace of marriages arranged on one side by the Pope, Martin V, as part of his project to unite the Eastern and Western churches, and on the other by Manuel II as part of his efforts to get military and financial aid for the battered empire. The brides arrived in November 1420 with large endowments Cleofe's story has already been told here. Sophia of Montferrat was quite young, already widowed, distantly related to the Palaiologues. She had blonde braids down to her feet, an ample bosom, a slender neck. They were married at Agia Sophia in January 1419, he was crowned co-emperor, she was crowned the next day, and he never spoke to her again. He couldn't bear her. The accounts are most unclear about what was wrong. A writer who knew the family said that she was well-mannered, but that John disliked her, and then came to hate her because of his dislike--thie sequence is understandable. But his unkindness, taken together with the fact that his brother Theodoros was simultaneously hostile to the lovely bride chosen for him, suggests problems within the Palaiologos family left unaddressed by contemporary chroniclers and modern historians. It is perhaps not the place to comment that their father, Manuel II, had written a treatise against marriage (except for dynastic reasons) shortly after his own, late, marriage, and that he had kept the manuscript circulating in the palace all those years. This man was crowned with his wife whom they had brought for him with many riches. He accepted her but he did not love her at all. . . . The emperor was extremely addicted to pleasures of the flesh and, for this reason, he had no affection for her. The Byzantine emperor was at Proikonēsos, at leisure with his lover who happened to be the daughter of a priest, and so he was not there when he was needed. This is the only time during his father's lifetime that John is reported to have done something he enjoyed. One ventures to hope that this was not the only such interval. Sophia herself lived quietly in the palace with the household staff she had brought from home. John, out of obedience to his father, did not try to end the marriage. But the year after Manuel died, a year after John became emperor in his own right, some time in 1426, Sophia and a few Italian-speaking attendants went for a walk in a garden along the shore. A Genoese boat drew abreast, they boarded, the boat sailed. Somehow no one minded, and Sophia was returned to Montferrat where she lived out her small life in a convent until her death in 1434. It is said that only thing she took with her from Constantinople was the crown with which she had been crowned Empress of the Romans. But the Orthodox used crowns for weddings, and perhaps it was the crown of her marriage. There was a third marriage for John the next year, his own decision, to the princess Maria of Trebizond. The young Bessarion, who was from Trebizond and related to her, and who appreciated womanly attractions, made the arrangements. If this painting above by Pisanello (who knew both Bessarion and John--and who might have seen a portrait of her), if this small and memorably lovely woman is actually intended to be Maria, we have a sense of the woman they might have seen. John apparently fell completely in love with her, and she with him. What fragmentary reports we have of their marriage shows her riding with him on hunts--wearing masses of rubies and other jewels, taking care of his guests, and sending letters to him when he was away. While he was away having the worst experience of his life in Ferrara-Florence, trying to save the empire, when the picture above was painted, Maria and Zoe, wife of John's brother Demetrios, both contracted plague. Someone in the palace wrote to someone in Florence saying that the women were ill, but it was decided not to tell the brothers, because John would get upset and take to his bed and things would drag out even longer. Some of the delegation learned, as they were struggling to sail home against the winter storms, that Maria had died of the Tenth Death, on 17 December, but it was decided again to keep the information from John because he was a bad sailor at the best of times, and with this he would insist on going ashore indefinitely.. When the brothers arrived back in Constantinople on the first of February, they were met at the dock by a large and sober group from the palace led by their brother Constantine. Someone confided to Demetrios that Maria had died, but not to tell John. Someone else confided to John that Zoe had died, but not to tell Demetrios. The party walked in silence up to the palace, each brother stoically grieving for the other, to be met by their mother, Helena, who took them to her suite and told them that they were both widowers. John buried Maria in the family church of the Pantokrator and collapsed into depression. When he himself died nine years later, the unforgiving Othodox clergy denied him funeral rites because of his support for Church Union, but his family buried him in Maria's grave. My name is Galo, and I live in Perú, I have sixteen-years-old, and I love Byzantine History, especially the Komnenoi, Angeli, Laskarid and Palaiologoi period. I must admit that your works are really magnificent, if you read spanish, you can visit my blog about Byzantium: www.declive-bizantino-blogspot.com. Greetings, and congratulations for you excellent work!! very nice publication, very interesting congratulations! John could not be called lucky, poor man. To be married to a women he did not love and also have two wives die young is extremely unlucky. He was though lucky to have found his true love, for that is very rare to find in a lifetime, even though it was for a short time. How very mean of the Orthodox clergy not to give him his funeral rites. That is a very unholy thing to do and very uncharitable. He was though buried by his family with the woman he loved. How very noble of his family to do this for him.